What was once Zehnder's Bavarian Haus Motel is now Zehnder's Splash Village Hotel and Waterpark with 89 hotel rooms and a 30,000 square foot waterpark, adjacent to Bronner's CHRISTmas Wonderland. 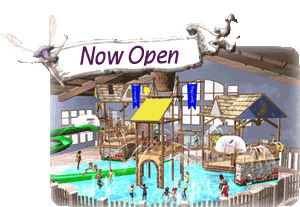 The waterpark features two 4-story tube slides, a lazy river, a body slide, multi-story play structure with a dumping bucket, zero entry pool, floor geysers and whirlpools. The Water play features include sprays and water guns.